Of course every country is unique. Food, culture, scenery, prices, and languages. There’s something so special about each one. One thing I find interesting about Spain is how old it is. Of course, every country on earth is old, but the culture is so old. Canada still retains a taste of the wild, of being a new country brought out of timber and mountains by settlers. Driving through Spain is like being taken on a trip to the past. So many old buildings mixed in with new. Old styles of architecture. Old world courtesy meeting up with new world speeds and attitudes. Sometimes it can be like we’re actually walking with Romans. Seeing the ancient castles in the distance just take you right back. Here are a few facets of Spain and its culture that we find fascinating and different. Football, the kind played with actual feet, is huge. They have their own national team, which won the FIFA cup in 2010. Over half the people you meet will say that they watch almost all the televised games. The citizens of Cadiz claim that they invented fried fish. In fact, they claim that their ancestors were the ones who gave the Brits their infamous fish ’n’ chips. We find that the Spanish people are very largely influenced by their Roman heritage. They are still mostly a Roman Catholic nation, with over 91 protected types of cathedrals. It is considered a Western Latin country, and their main language, Castilian Spanish, is Latin-based. Obviously many bridges, roads, causeways, amphitheaters, and Arches of Triumph can be traced back to the Romans. 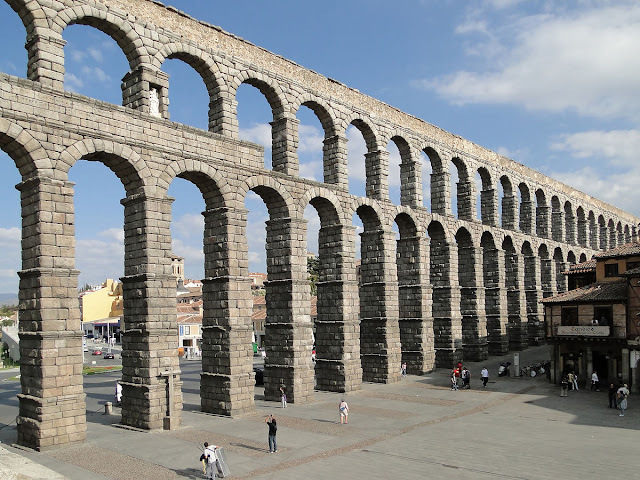 A prime example of Roman architecture in modern Spain is the magnificent Aqueduct of Segovia. Of course you know from reading our posts how beautiful the countryside is. We’re not alone in admiring it. Spain is the second largest tourism nation in the world. Spaniards are a very warm people who use a lot of body language, especially hand gestures, to communicate. A common traditional greeting is a kiss to both cheeks. Likewise their concept of a good quality of life has a lot to do with free time and siesta’s are a part of daily life. And don’t come early to a party. By that I mean around midnight. Most parties will get started after 12:30! We see some formal manners, too. Spain has gone from being very patriarchal and structured to one of the lowest-birth rate countries in the world, with women working and going to university, but some things haven’t changed. Courtesy is still courtesy. Dressing up formally for business or visiting and showing proper respect, like bringing pastries or chocolates to a dinner, is still expected. Another interesting thing about Spain is that there is a huge gaming following. Lotteries (especially at Christmas time), horse races, bingo… They’ll also try their hands in standard casinos, of which there are over 20 across the country, and we discovered that Barcelona is one of the principal hosts of the European Poker Tour. We also found out that if poor Louis gets towed for some reason we’ll be able to find him again. In Spain a note is left behind when a car is towed to tell you where it’s been taken! Another example of old world courtesy? Spain isn’t Canada, that’s for sure. But we’re loving exploring it and learning new kinds of neat things all the time. We could certainly spend months in Spain and still not see everything that we want to see! North America is old too by the many, many ruins found and artifacts. It got overran by Europeans when Christopher Columbus discovered Americas. Native Americans still hold ceremonial passed down from ancestors and some still dress in their Native dress/style. South America also holds ruins and they also retain their culture with food and life style. I imagine some date back to before the Roman times. It's amazing to see old buildings, bridges, aqueducts, castles, etc. It boggles my mind to see them in pictures you share. I read up on the Jewish Water synagogue and took a web tour of the inside...awesome!! Yes, agreed it is old too but not like it is here in Europe. It is mostly just artifacts and of course the legends that have been passed down through history. There is very little left of any of the dwellings/buildings that were used, other than the pyramids there were built in Mexico and further down into Central and South America. The history back home still can't compare to the history over here in Europe in our opinion. Glad that you read up on the Jewish Water Synagogue and did the web tour, it was very interesting indeed. Great pictures! Some of m favorite places to visit are truly old sites and cities/towns. We like a mixture of the old sites, towns and cities along with the countryside and the nature. It is all so interesting and beautiful to look at.